Before the Dodge Chargers were dragging safes through Rio in improbable bank heists, before the orange Toyota Supra, before living your life a quarter-mile at a time, before Dom and Letty and Brian, there was just Stephan Papadakis, his friends, and Los Angeles. They weren’t interested in bar hopping or clubbing or what everyone else their age was doing. They were interested in cars, deserted streets and going fast. They liked to race, and there wasn’t an easier place or time for it than LA in the early 1990s. These were the Rodney King years, when crime, racial tension and police brutality were at a boiling point. 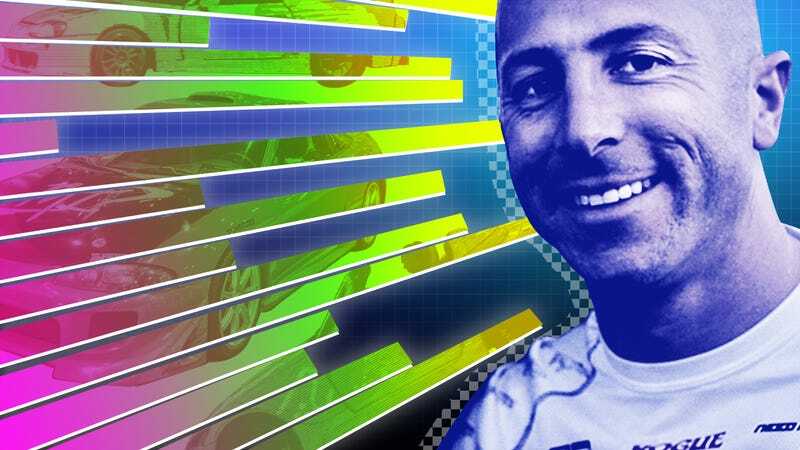 Out of that atmosphere, Papadakis would rise to become a legend in drag racing history, shattering front-wheel drive records in his little yellow Hondas, proving that these underestimated tuner cars had real performance potential. Today, Papadakis runs a successful race shop that bears his name, but his ascent into legalized motorsports had beginnings in illegal, underground racing on the darkened streets of Southern California. It’s a far cry from the kind of street drag racing where Papadakis cut his teeth. Back in 1993, when Papadakis was still in high school, the underground street racing scene was rich. You could find a street racing location almost five nights out of the week. If you went out at around nine or 10 at night, chances were good that you’d find something. During the school year, Papadakis would only go out on the weekends with his friends. This was where cars like the Honda Civic reigned as king. This was Southern California, after all, the beachhead for Japanese imports into America. Tough, cheap to buy and easy to modify, the Civic was ubiquitous. There was a vast amount of knowledge on how to modify it and tons of parts were available. Papadakis himself had one, a 1991 Honda Civic Si. And it wasn’t just that speed and racing that gave him an irreplaceable thrill, though that certainly did help. Papadakis was born in New York in 1977, but he grew up in the surfer and skater town of Huntington Beach, California. He said he never felt like he fit in there. He liked cars and he liked speed. Those street races, ones he’d heard stories of even before he got his license, was where he knew he had a chance. From there, he could start meeting people from all different kinds of cultural and economic backgrounds, expanding his horizons past what was down the block from his front door. He grew his social life there. There were ex-Asian gang members who still wanted to be part of a group. There were enthusiasts who didn’t have the money to go to race tracks but still wanted to run, so they would join the street racing scene and go canyon carving. There were people who just surrounded themselves with cars for the weekend instead of going out to drink, who just wanted to hang out with other car people. As strongly as this was rooted to the sweeping streets of Southern California, the story of The Fast and the Furious started in New York City, as another, similar scene had sprung up uptown in Washington Heights. In May of 1998, before what became a multi-film franchise was even a scrap of thought in anyone’s minds, a story about a young Dominican drag racer named Rafael Estevez appeared in a VIBE magazine article. The piece told a story of the import tuner and street-racing culture in uptown Manhattan. And the dramatic flair of it was undeniable: A Nissan 300ZX faced off against a Mitsubishi Starion. Tires chirped into second. Superchargers whined. Money changed hands. The story captured the imagination of some very influential people, a few of whom worked at Universal Studios. Sensing potential, Universal wanted it as a movie, and picked up the story. They pitched it to screenwriter Gary Scott Thompson. Even before writing the story that ultimately became The Fast and the Furious, Thompson was familiar with this kind of car culture. While attending university in Southern California, he noticed that people were modifying these little import cars to the point where they’d absolutely smoke a muscle car from a stop. “Well, that’s interesting,” he thought to himself. And a block away from his house on the Westside of LA, he’d see a group of college kids obsessed with wrenching on their project cars. These kids fascinated Thompson. All they seemed to want was to tear down their cars just to put them back together again. One weekend, the car would be left-hand drive. And on the following weekend, it would have been converted to right-hand drive. And when they drove around as a group, they did it in a line of cars, like a caravan. So when Thompson was tasked with writing a screenplay about street racers, he set it in Los Angeles. That’s what he knew. As part of his research, he befriended some of the enthusiasts and drivers, even attending a few underground street races himself on Mulholland, in the valley, PCH, Ventura, Orange County and downtown LA. I asked him over the phone if those races were open to just anyone. “You had to know someone to get into the races,” he replied. He went to the open races, too, at Pomona and Irwindale, where he saw all kinds of cars—real imports, ones running real NOS. He hung out there and talked to the drivers and the aftermarket crowd, soaking up the culture, trying to dissect it and understand it. And what intrigued Thompson the most about the import tuner and street racing scene was how these enthusiasts were doing all the work themselves, carrying on the proud tradition of the post-World War II hot rodders in their own way. He didn’t really see people sending their cars out to a shop or a garage. It was usually a group of friends undertaking the project together. This, he knew, had to be very clear in his screenplay. Despite the love and work these tuners poured into their cars, they garnered no respect from the American muscle or expensive exotic crowd. In some ways, Thompson mused, being looked down on by the rest of the car scene brought these people together. What resulted was a close-knit and fiercely protective community of gearheads, outcasts who cherished and preserved this corner of car culture that belonged to them. The Fast and the Furious hit screens in 2001. Looking back on it now, it immortalized one of the most diverse scenes in car culture. Indeed, it stood out because it debuted at a time when feature films tended to be more monochromatic than not. Racial tensions in LA coming out of the 1990s were high. The 1992 Rodney King riots lasted six days, with thousands of people taking to the streets. Subsequent multi-racial films like Rush Hour felt like hollow attempts at showing that everything was suddenly buddy-buddy and copacetic again—but The Fast and the Furious was able to pull off diverse representation without its characters feeling like they were merely campy caricatures. Rather than achieve diversity by hiring some actors with varied ethnic backgrounds and having them “act Asian” or “act Hispanic” as many movies and TV shows mistakenly do, the film portrays them as people, because that’s who they are. No fanfare or self-congratulatory attitudes about the inclusion. Papadakis remembered that powerful sense of connection in the street racing scene in the early 1990s, even though there were racial differences between them. These were community-based car clubs, so people tended to be of similar ethnic backgrounds because that’s just who you lived close to. But these different clubs came into contact with one another once there was a common meet-up point. Hispanic crews would come out of East LA and Asian communities came out of Irvine or San Gabriel Valley. Dominic Toretto and his street racing crew ended up with one of the biggest movie franchises in the world—breaking global box office records—even if by the fourth or fifth installment you were basically just watching an action movie with some cars in it. Because as The Fast and The Furious grew from being a movie into a franchise, the films started to change focus. Heists. Submarines. Curiously-long runway chase scenes to catch international criminals. Perhaps it’s because the writers realized that glamorizing street racing—and the crashes and death and arrests that often go with it—wasn’t the most marketable thing to splash across America’s screens. At the same time, the paths the actual racers took ultimately diverged from their lawbreaking days. Real street racers like Papadakis knew that their illegal lifestyle just wasn’t sustainable. Or safe. Something had to change. At the time, street racing was the least of the LAPD’s problems, but people involved knew they were playing with fire anyway. He called the racing activity only “mildly interesting” to law enforcement because, during that time, there were much bigger things for the police to worry about. Things like the crack epidemic, homicides and the ongoing warfare between the Bloods and the Crips. The high crime rate across Los Angeles provided a cocoon for street racing to grow and flourish, but it was still illegal. Harsher police crackdowns would happen eventually. There is a certain degree of perceived edginess that shrouds a person when they tell you that they are a street racer. Some wear it as a badge of rebelliousness. Papadakis doesn’t. The frankness with which he described his street racing days was striking. No flicker of shame or embarrassment, just an acknowledgement that it happened. But he was also upfront with saying it was an illegal activity. And consequences became real for him—fast. But racing and going fast weren’t things he wanted to give up; they were the only things he cared about. If he couldn’t stay illegal, he’d have to move to legitimate motorsports. Unfortunately, most university programs don’t set you up with a trajectory for a career in motorsports, so after high school, Papadakis worked for a shop that built racing engines, figuring that was the best place where he could get his racing career started. “I wanted to learn how to make my car fastest,” he said, plain and simple. He wanted to figure out how to keep racing and somehow make a living out of it. Legally. And just like the underground street racers in the VIBE magazine story, Papadakis, along with other Southern California enthusiasts, began to turn to legal outlets to satisfy their speed needs. There was very little by way of legalized import drag-racing in the region in the early 1990s. “There came a point when the streets were no longer feasible to test major modifications to your car,” Choi affirmed. And even if there was, there were still gatekeepers. “If you wanted to go to the traditional, legal drag races with your Honda or Toyota, you were kind of shunned by the V8 guys,” Papadakis added, echoing what Thompson also learned while he was researching his script. And besides, the tracks those dragsters used were not set up for front-wheel drive cars. Choi and his friends went searching for a place to drag race at the Los Angeles County Raceway in Palmdale, Califonia, but kept getting turned away. He also noticed a conspicuous absence of import vehicles at the drag strip. He quickly put two and two together. And so, on July 8, 1990, Battle of the Imports was born. The inaugural crowd was small, maybe 50 cars and a few hundred spectators, Choi recalled. By 1995, word had gotten out and hundreds of cars were in attendance, the stands filled with thousands of fans and spectators. All kinds of people showed up. Men, women, families, children. For many street racers, Battle of the Imports was a godsend. It was a place where you could max out your car and not be worried about breaking laws or getting into an accident. A legal and sanctioned place to race, dropped right into their laps. It also was able to draw even more spectators and supporters, people who were willing to go to a legal event instead of sketchily standing on a random street corner at night, checking over their shoulders for cops. A video from a 1996 Battle of the Imports event, shot on a videotape and digitally transferred, looks just like Race Wars event from the film. And, for many Asian American car enthusiasts living in Southern California, the event offered something else. The tens of thousands of teens and college students who attend import racing events on the weekends have found a place to be accepted. The culture has grown so rapidly and so furiously that it is practically the norm for Asian American youth to participate in the scene in one way or another. Today, import racing has spilled over into the mainstream to such an extent that people in southern California rarely even blink when they drive behind a fixed-up car on the freeway. The Asian American import car racing scene has hit the American cultural mainstream with high speed and shows no signs on slowing down. FC: Oscar Jackson running 13s in his wife’s Civic at the first Battle of the Imports. Tony Fuchs racing against the Top Fuel Racing CR-X. It was kind of like a USA versus Japan [showdown]. I would also say when Stephan [Papadakis] ran 9s at the same event. Last summer at Maple Grove Raceway in Reading, Pennsylvania, a Southern California racer named Stephan Papadakis drove his front-wheel-drive ‘91 “AEM Honda Drag Civic” down the quarter-mile in under nine seconds, 8.89 seconds to be exact, at 162 mph, faster than any other front-wheel-drive car had ever gone. It was the equivalent, in this subculture, of Eddie Hill’s 4.99 or Kenny Bernstein’s 300 mph. “I guess it was a pretty good moment, now that I look back,” said Papadakis, sitting in his shop in Ontario, California. Front-wheel drive imports had gone all the way, and it was Papadakis who was at the tip of the spear. Much like the evolution of The Fast and Furious, the further Papadakis distanced himself from illegal racing, the more opportunity he found. Presently, Papadakis runs his own race shop, called Papadakis Racing. He works with Toyota, competing in Formula Drift with driver Fredric Aasbø, recently building a furiously yellow drift car that sends 1,000 nitrous-boosted horsepower to its rear wheels. It’s a great gig, one where Papadakis gets to experiment with massive amounts of horsepower, speed and racing. The kid from Huntington Beach who liked to go fast had made it. The peak of the tuning culture, as Papadakis put it, was coincidentally “in the early 2000s, when The Fast and the Furious came out.” In the years since, the big sponsorship money behind import tuner cars shifted over to the newer, flashier drifting, so it’s no surprise that Papadakis made the transition, too. But even back in the street scene itself, things have changed. The deadliest year on record was 2007, with 18 fatal crashes. After a period with relatively few recorded deaths, the count grew in recent years, with 15 fatalities in 2015, 11 in 2016 and 12 deaths in 2017, the Times analysis shows. The dead were overwhelmingly male and young: More than half were 21 or younger, including two children, ages 4 and 8, killed along with their mother. Slightly less than half of the victims—47%—were behind the wheel. The rest were either passengers in the speeding vehicles, spectators or people simply walking on a sidewalk or driving home. A 2017 story in LA Weekly highlighted members of law enforcement attempting to figure out new ways to discourage street racing by suggesting that the city put down rumble strips on popular streets used by racers. He says the real, long-term solution is to find a safe, off-street venue for young people who want to race. Gallaz and his organization have been lobbying the city for years to open such a venue at Terminal Island, where such racing last took place in the 1990s. He says city officials have consistently ignored the idea. Today the city of Los Angeles is home to zero sanctioned drag strips, though they can be found in the Inland Empire and San Diego County. But the kids aren’t shutting down streets for drags alone, anymore. The public is more familiar with “takeovers,” when a group of people and a few cars take over a street or intersection and block it off to do donuts or other stunts. LAPD has classified the spectrum of “behaviors and activities” into six categories: drag racing (obviously), street and intersection takeovers, drifters, stunt bikes and off-road vehicles, low-riders, spontaneous racers (at stoplights) and car clubs and spectators. I asked Sgt. Garcia if he thought Hollywood had created street racing copycats in LA today. Posting on social media gives a tangible score-keeping system of garnering likes and followers, totally removed from the strict who-is-faster-than-whom world of street racing. I asked Papadakis what he thought, if the import tuner and racing scene that he grew up with was still around, if it was still as prolific as it once was. Papadakis had a few theories on why everything phased out, the first being that the younger tuner crowd simply grew up. They made enough money to buy their dream cars, like the Supra and the NSX. There was no more need to modify a cheap Civic and give it a massive turbo, let alone to hit the streets in it. Moreover, strict California emissions laws make it hard to modify cars so that they still pass inspection. Since 1967, California has been able to implement stricter regulations than the rest of the country. And in 2004, the California Air Resources Board passed the nation’s first greenhouse gas emissions standards for cars. On top of that, cars now come from the factory so advanced that they’re hard to work on just by yourself and a group of your buddies. Options from the dealer are getting better and better, too. Even economy cars come with quality sound systems now. You don’t need to put in your own, and you can factory option a big, obnoxious wing if you want to. The era is over, in any case, faded away. Everyone out of the street racing scene of the 1990s has grown up and moved on to bigger things, Dom and Papadakis both.